Jean-Léon Gérôme (1824–1904), The Death of Caesar (detail) (1859), oil on canvas, 85.5 x 145.5 cm, Walters Art Museum, Baltimore, MD. By courtesy of Walters Art Museum, via Wikimedia Commons. After Julius Caesar’s amorous adventures with Cleopatra in Egypt, and his return through Asia, he resumed his dictatorship in Rome. The following year he was made consul, and crossed into Sicily in pursuit of Cato and Scipio. Those two had fled from the battle of Pharsalus to muster their forces in North Africa. When Caesar landed in North Africa, he learned that Cato and Scipio had been encouraged by an oracle in their plans against him. Furthermore, his own forces lacked logistic support, his men often going hungry and their horses having to be fed on a mixture of seaweed and grass. They were repeatedly attacked by the local Numidians, sometimes when their cavalry were off duty, and once were almost defeated as a result. When Caesar returned to Rome, he celebrated his backlog of triumphs, in respect of victories in Egypt, the Black Sea, and Africa. Andrea del Sarto (1486–1530) and Alessandro Allori (1535–1607), Triumph of Caesar (c 1520), fresco, 502 x 356 cm, Villa medicea di Poggio a Caiano, Poggio a Caiano, Italy. Wikimedia Commons. This large fresco in the Villa Medicea in Poggio a Caiano, Italy, was painted by Andrea del Sarto and rather later by Alessandro Allori. 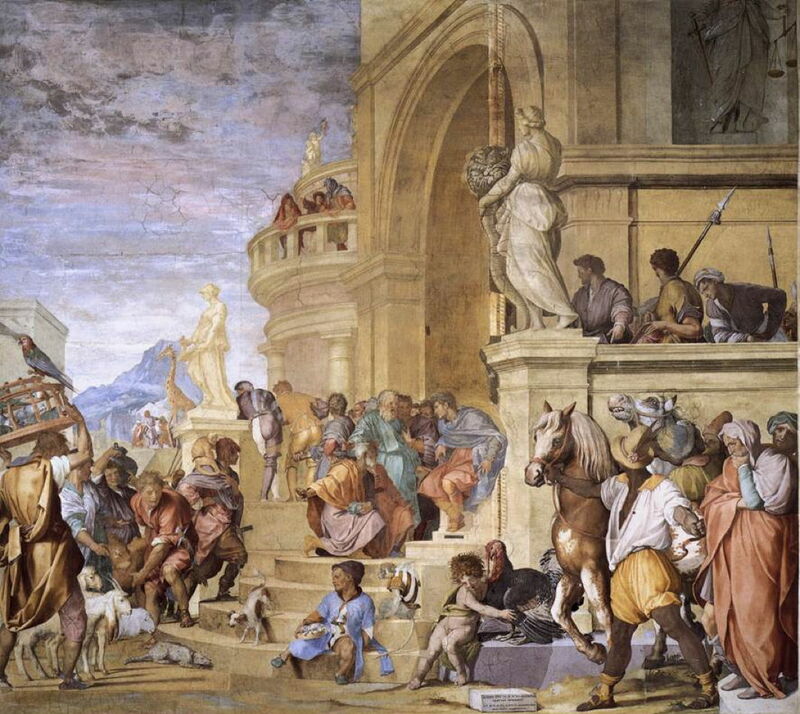 It shows an unconventional scene in the Triumph of Caesar (c 1520), in which Caesar sits on the steps in the centre, and a giraffe stands looking over the city of Rome, to the left. 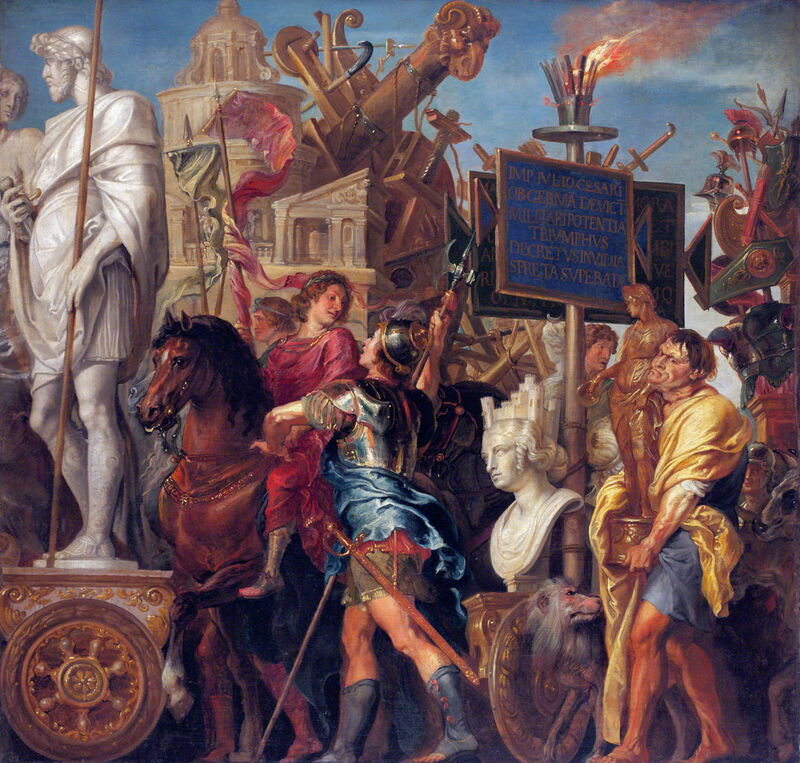 Peter Paul Rubens (1577–1640) and Erasmus Quellinus II (1607–1678), Caesar’s Triumph (after part No. II and IX in the cycle painted by Andrea Mantegna) (date not known), oil on wood, 87 × 91 cm, Národní galerie v Praze, Prague, The Czech Republic. Wikimedia Commons. Andrea Mantegna painted a cycle showing scenes from the life of Julius Caesar. Peter Paul Rubens and his former pupil Erasmus Quellinus II painted Caesar’s Triumph after the second and ninth paintings in that cycle. Among the prisoners paraded in that triumph was the infant son of King Juba of the Numidians, who Plutarch informs us later became a distinguished Greek historian. Rome then held its first census since its Civil Wars, and discovered that its citizenry had fallen from 320,000 to 150,000 as a consequence. Caesar was made consul for a fourth term, and led an expedition to Spain against other enemies, the sons of Pompey, who had been building an army there. In this, his last great battle, his men were hard pressed, but managed to kill over thirty thousand of their enemy. Although he celebrated another triumph afterwards, Romans recognised that this had been won not against their enemies, but the family of a once mighty Roman. In spite of that, in an effort to avoid further civil war, the Romans appointed Caesar as dictator for life, effectively making him a tyrant. Caesar had grand designs, including a plan to launch an expedition against the Parthians, then complete a grand circuit of the Roman Empire, in the process cutting a canal through the isthmus at Corinth, in Greece, and diverting the River Tiber itself to enable large ships to sail into the heart of Rome. Nothing came of these, and the Corinthian Canal wasn’t opened until 1893. His greatest and most lasting achievement, though, was the adjustment of the calendar, so that it better aligned the lunar and solar cycles in what is still known as the Julian Calendar, introduced on 1 January 45 BCE, and maintained until its improvement by the Gregorian calendar of 1582 CE. Caesar’s passion for royal powers generated open and deadly hatred. The senate felt that his powers needed curtailment, and at one stage the atmosphere grew so tense that Caesar offered his throat to anyone who wished to kill him. The situation worsened during the festival of the Lupercalia, when two of the tribunes removed jewels which had been placed on all Caesar’s many statues, and imprisoned those who had hailed Caesar as a king. For that, the angry Caesar removed those tribunes from office. The Romans came to favour Marcus Brutus as successor to Caesar. A series of portents were reported, including lights in the sky and birds of omen being seen in the Forum. One seer advised Caesar to be particularly wary of the Ides of March, when he would be in great peril. The senate had assembled. Antony, a friend of Caesar, was kept outside in a long conversation by Brutus Albinus. Caesar entered the meeting, and the senate rose in honour. Friends of the conspirators took places around the back of Caesar’s chair, and Tullius Cimber presented Caesar with a petition on behalf of his exiled brother. Caesar pushed the petition away, and started to grow angry. Tullius then seized the tyrant’s toga and pulled it down from his neck – the sign for the start of the attack. Casca struck the first blow with his dagger in Caesar’s neck. Caesar grasped the knife and asked Casca what he was doing. Those watching who were not part of the plot dared not run away, or go to Caesar’s aid. The conspirators then drew their daggers, hemmed Caesar in, and stabbed him repeatedly. Caesar pulled his toga over his head and sank down against the pedestal of a statue of Pompey, which was covered in his blood. He was stabbed twenty-three times. Karl von Piloty (1826–1886), The Murder of Caesar (1865), oil on canvas, dimensions not known, Niedersächsisches Landesmuseum Hannover, Hanover, Germany. Wikimedia Commons. 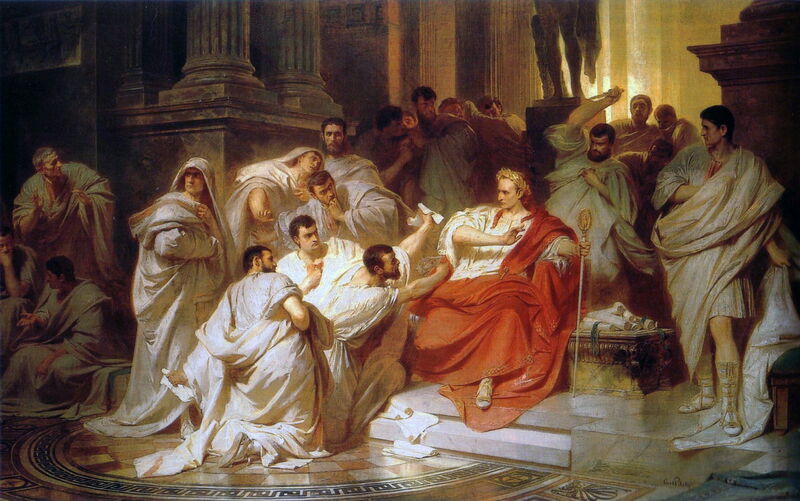 Karl von Piloty’s The Murder of Caesar from 1865 shows the moment before the first blow, with Julius Caesar sat on a throne in the portico of the Senate, Tullius holding his petition in front of him. Immediately behind him, Casca has raised his dagger above his head, ready to strike when Tullius pulls Caesar’s toga away. 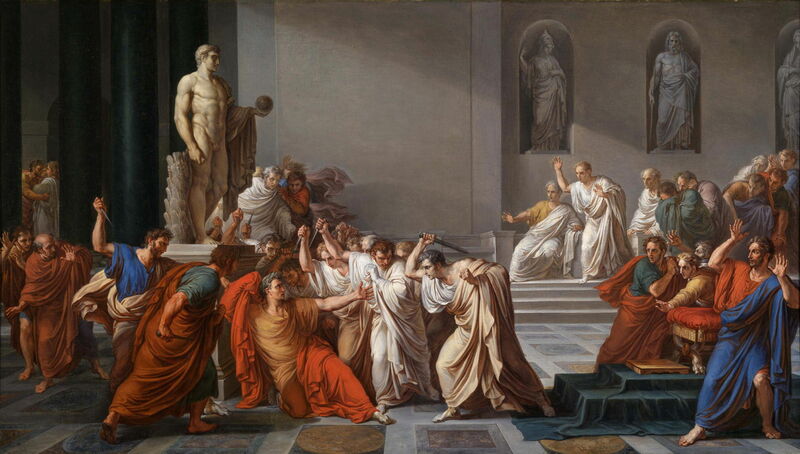 Vincenzo Camuccini (1771–1844), The Assassination of Julius Caesar (1804-05), oil on canvas, 112 × 195 cm, Galleria Nazionale d’Arte Moderna, Rome. Image by Rlbberlin, via Wikimedia Commons. Vincenzo Camuccini’s Assassination of Julius Caesar from 1804-05, shows a moment a little later on in the attack, as Caesar is falling to the floor by the pedestal of Pompey’s statue. 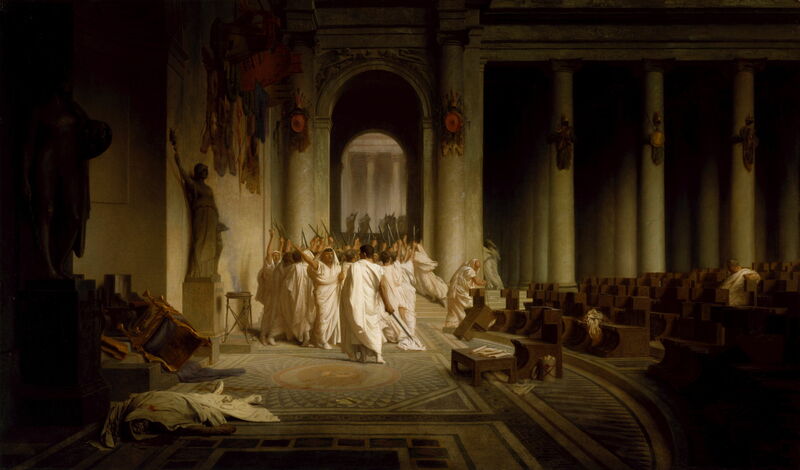 Jean-Léon Gérôme’s The Death of Caesar from 1859-67 shows Caesar’s corpse abandoned on the floor, as his assassins storm out from the Senate, brandishing their daggers above their heads. Julius Caesar, whole text in English translation at Penelope. Posted in General, Life, Painting and tagged Allori, biography, Camuccini, del Sarto, Gérôme, Mantegna, narrative, painting, Plutarch, Quellinus, Rubens, von Piloty. Bookmark the permalink.